The elections are over, thankfully, but the results may not sit well with many readers. Today, as I began my early morning exercise routine and tuned into NPR news, I was shocked to learn than Donald Trump has been elected the 45th president of these United States. What this means for progressive causes like climate change is uncertain. But we will surely find out in coming months and years. Meanwhile, we must continue supporting all plans and efforts to create greater resilience and sustainability. Educating the public and creating greater understanding about the accumulating effects of climate change is an essential strategy, hence this commentary. I watched the film online via the National Geographic website, where it will be posted until November 7. It’s also listed on YouTube (https://www.youtube.com/watch?v=90CkXVF-Q8M), and I assume it will remain available there, in which case, I highly recommend you view it. Within the first two days of the film’s release, there were more than 3.5 million views, in addition to trending on social media outlets. Rob Hopkins, a popular blogger on Transition Network, is eminently qualified to offer an in-depth review of this significant film, which is presented in this article: Leonardo Dicaprio’s ‘Before The Flood’: A Review . At the start, he readily acknowledges that DiCaprio has cared deeply about climate change for many years. As DiCaprio traveled to various areas of the planet to personally experience environmental damage, he encountered horrific scenes of environmental devastation—all attributable to humankind’s thirst for natural resources used in powering modern civilization. When flying over the wide swatch of Canadian Tar Sands, DiCaprio likened it to Mordor, the bleak and hellish fictional world of Middle Earth in Tolkein’s trilogy, Lord of The Rings. DiCaprio exclaims, “Everything I have seen on my journey has absolutely terrified me”. And it also terrifies viewers! As for shortcomings, Rob Hopkins notes that DiCaprio’s reflections fail to explain how the future could be so much better than exists today—if only humanity would seek to create a more equitable, just, and sustainable world. One reality check: ‘Before the Flood’ presents a case where climate change is to be solved politically and technologically, made possible by such questionable solutions as international agreements, new tax regimes, renewable energy, reduced meat eating, and battery storage. Instead, Hopkins suggests—and I agree—that “climate change demands us to take risks, to reimagine sacrifice as opportunity. But if we avoid the sacrifice bit, we skirt around the heart of the issue, and around our own hearts too”. > Huffington Post: Guessing Wrong On Climate Change (Donald L. Katz, M.D.). The particular theme discussed on a hike [taken by father and son, both doctors] was the inattention to climate change in the presidential campaign, and the failure of all concerned to raise the topic during any of three presidential debates. We lamented this together, and then my father posed the question he felt the candidates should have been obligated to answer at some point: what if you are wrong? First, the question can be hypothetical, but answer it anyway. What if you WERE wrong? Second, the shape of the earth, heliocentrism, and the harms of tobacco were opposed vehemently as well; history is not on the side of those opposing the weight of evidence. So, play along. Third, you are well advised to recall the wit and wisdom of Bertrand Russell. Wise people admit doubts; fools and fanatics do not. So, let us know whether you are a fool, or a fanatic- or answer the question! The playing field here really isn’t level. The evidence, and global consensus among experts, is overwhelming. > Resilience: Leaving Our “Extractivist” Past Behind Is About Survival (Olga Bonfiglio). At the Arcus Center for Social Justice Leadership’s annual Without Borders conference held last weekend at Kalamazoo College, keynote speaker Naomi Klein explained that the tension between what is politically possible under the world’s current political and economic systems and what is ecologically necessary exposes the need for change. Doing something about climate change has failed since 1988 when neoliberalism emerged to promote privatization, fiscal austerity, deregulation, free trade and reductions in government spending to enhance the private sector in the economy. Such policies have created in people a profound sense of hopelessness about climate change, said Klein. She challenged the audience to work for “climate justice” by reversing the “extractivist” point of view of the Earth and promoting the “caretaking” of one another, an ethos indigenous people advocate. > Resource Insights: Howard Odum, Transformities And The Urban/Rural Divide In America (Kurt Cobb). Rural areas have been pummeled economically by the globalizing economy. That economy rewards the innovations and technology invented and deployed in cities more than the commodities that come out of the countryside. Hidden beneath these cultural and economic factors is an energy imbalance that Howard Odum, the great pioneer in understanding energy flows in nature and society, first identified in his work on what he called transformities. The urban population of the United States now accounts for more than 80 percent of the total U.S. population. It is no wonder that rural populations are feeling ignored and even threatened. It is harder and harder to make a living in rural locations, and, with 24/7 communication, it is harder to maintain a rural culture that is distinct from that of most cities. In sum, rural folk feel their livelihoods and “way of life” are threatened. > Resilience-Shareable: The Case For “Disruptive Normality” (Joe Mabel). In recent years, we’ve started to see cases of promising sharing and collaborative practices falling into the traps of neoliberal ways of thinking and doing: carpooling and time-banking ideas transforming into the likes of Uber and TaskRabbit, co-housing concepts producing closed and exclusive gated communities, and so on. How should we prevent the social potential of sharing practices from being neutralized by the power of the neoliberal ideas and economy? How can promising collaborative practices spread while maintaining their social value, which is to contribute in the transition toward a resilient and sustainable society? To answer these questions, it is helpful to introduce three interlinked concepts: collaborative organizations, relational goods, and social commons. By disruptive normality I mean a set of practices that, even though they might become normal in a given context (and therefore can locally spread), could be disruptive in other contexts, where mainstream practices are still dominant. > Common Dreams: Why Campaigns, Not Protests, Get the Goods (George Lakey). Campaigns are very different from protests because they are built for sustainability and escalation. When a campaign inspires other campaigns, the sum of them becomes a movement. Today we see the same phenomenon: A cluster of campaigns related to a theme becomes a movement, like the fight for a living wage or against pipelines. Campaign activists in a movement often realize that, even though they cannot control whether they will win their own campaign, pushing hard locally counts toward winning the movement’s overall goal. That local understanding builds the power of the total movement because it motivates increased effort and smarter strategizing. Campaigns are ongoing and therefore invite participants to play what strategist Bill Moyer called the four fundamental roles for social change. Campaigns can and do generate movements with enormous power. > NPR: A Changing America Faces A Stark Choice This Election (Domenico Montanaro). America is changing. It’s getting browner, as population growth stagnates among whites. And Millennials, who now outnumber baby boomers, are poised to become the dominant political generation of the next 35 years beginning in this election. Non-whites now make up a majority of kindergartners. By the next presidential election, the Census Bureau projects, they will be a majority of all children. And by 2044, no one racial group will be a majority of the country. 2016 could be the first election in which the white vote is at or below 70 percent as a share of the electorate. For perspective: in 1976, whites made up 89 percent of voters. As Latino and Asian immigration increased in the 1990s and 2000s, the white vote has been set on a steady decline. America is at an inflection point—politically and culturally. > The Guardian: The Paris Climate Agreement Is Now Official (Fiona Harvey). The significance of the Paris agreement coming into force today may seem like an anti-climax, given the travails that led up to its signing last December. But this is the first time that a legally-binding agreement, signed by all of the world’s functioning governments, has laid down a commitment to limit the growth of greenhouse gases in the atmosphere with the goal of preventing global warming exceeding 2C above pre-industrial levels. The Paris agreement is legally binding in forcing governments to accept and cater for the 2C limit, but the commitments on curbing greenhouse gas emissions in line with that goal are not legally binding. So while the agreement should be hailed as a massive and historic step forward in international efforts to avoid dangerous levels of global warming, it is potentially fragile. Meanwhile, the signs of danger are growing increasingly strong, as record-setting temperatures keep mounting. 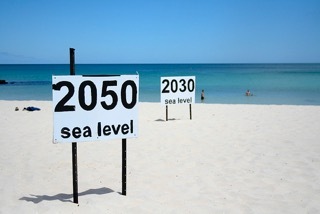 > Popular Mechanics: Scientists Say We Underestimated How Much Sea Levels Have Risen (David Grossman). Scientists say in a new study that previous measurements of rising sea levels in the Northern Hemisphere in the 20th century were wrong—it’s actually worse. Crucial to the work was use of “ice melt fingerprints,” a tool originally used in 2001 to help scientists determine why melting ice in say, Antarctica, is different from melting ice in Alaska. Using the fingerprints, scientists from NASA’s Jet Propulsion Laboratory and the University of Hawai’i at Mānoa closely analyzed various ice centers of the planet for a look at how they’ve been melting. Greenland was estimated to have been wrong by 28 percent off, while the melting Alps were off by 5 percent. The variations in individual ice centers give scientists reason to ratchet up the amount sea levels on the whole actually rose in the 20th century. Instead of the former estimate of a 5.5 inches rise, the most likely amount was closer to 6.7 inches. > NPR: 300M Children Are Breathing ‘Extremely Toxic’ Air, UNICEF Says Merrit Kennedy). According to a new report from UNICEF, one that uses satellite imagery to determine the impacted areas, affected children live in places “where outdoor air pollution exceeds international guidelines by at least six times.” Altogether, some 2 billion children are breathing air that has been deemed a “long term hazard,” exceeding minimum standards set by the World Health Organization. Poor air quality can have an outsize impact on children, as their lungs are still developing; respiratory airways are more prone to blockages; and they breathe twice as fast than adults. The problem is worsening because of industrialization, and studies show that outdoor air pollution could become the leading cause of environment-related child death by 2050. A recent World Health Organization report said 92 percent of the world’s population breathes air containing dangerous levels of pollutants. > Post Carbon Institute: The Case Of The Vanishing Oil Reserves (Richard Heinberg). Someone is stealing the world’s valuable petroleum reserves right from under our feet—and getting away with it. Exxon and other companies have been engaging in similar write-downs of reserves. They all point the finger at low oil prices—almost as if they’re working together. A Bloomberg article claiming that oil discoveries have been super-low the last couple of years featured a breathtaking graph showing that the year 2015 yielded the fewest oil discoveries in decades—with 2016 on track to be even worse. The culprit: Depletion! Every year we’re depleting what’s left even faster than we were the year before. The oil companies are writing down their reserves because at today’s prices they can’t afford to extract an ever-increasing fraction of their remaining oil. There are only two ways to exit the oil depletion game: switch to other energy sources or just use less. > The Guardian: Imagine A World Without Animals. You’ll Soon See How Much We Need Them (Jules Howard). A couple of years ago we heard news that 50% of all vertebrate species had disappeared in 40 years. , we were greeted with news that by 2020 the figure is likely to rise to 66% of all vertebrates. It is no wonder that the conservationists are shouting. It is no wonder that they are so desperate to get their message heard. Animals, it seems, are on the way out. And no one appears to much care. Sure, there would be some tough choices at first. One particularly pressing matter would be finding a way to cross-pollinate flowering crops. Global emissions of CO2 would be greatly reduced without them, seeing that the gas that spouts forth from farm animals accounts for 15% of human-caused global CO2 emissions. And pets also contribute to global emissions. Can we imagine a world without animals? > Scientific American: First Cases Of New Superbug Spotted In U.S. (Sharon Begley). Just five months after federal health officials asked hospitals and physicians to be on the lookout for an often-fatal, antibiotic-resistant fungus called Candida auris, 13 cases have been reported, the Centers for Disease Control and Prevention announced . It is the first time that the fungus, which is easily misidentified in lab tests as a more common candida yeast infection, has been found in the US, and four of the first seven patients with it have died. The global spread of C. auris has had public health officials on alert for imported cases, but all of the US cases seem to have been contracted domestically. Although 60 percent of people with C. auris infections outside the US have died, the CDC said, that figure is based on a small number of patients, many of whom had other severe illnesses, making it unclear how serious the infection on its own might be. > Great Transitions Initiative: Towards A Sustainable University (Anthony Cortese). Designing the New American University, a new book by Michael Crow and William Dabars, features Arizona State University as an interesting case study in creating transformative change in higher education. An educated citizenry needs sufficient knowledge and critical abilities in transitioning to a thriving, just, and sustainable society. The content of learning would reflect systems thinking, and the context of learning would make human-environmental interdependence, values, and ethics central to teaching in all the disciplines. The process of education would emphasize active, experiential, inquiry-based learning and real-world problem solving on the campus and in the larger community. Higher education would practice and model sustainability, incorporating sustainable practices into its operations, planning, facility design, purchasing, and investments. Finally, higher education would form partnerships with local and regional communities to foster social vibrancy, economic security, and environmental sustainability. > Sustainable Food Trust: Campaign To Halve Europe’s Food Waste (Martin Bowman). The SFT has recently backed a new campaign to halve food waste in Europe. Martin Bowman, campaigner for This Is Rubbish, talks more about how people can get involved. If the world’s food waste was a country, it would have the third largest carbon emissions after the US and China. Incredible things have been achieved, but in the face of 88 million tons of food wasted in Europe, we’re collectively only scratching the surface. That’s why we need massive international cooperation on food waste, with governments committed to concrete action on the issue. It’s really time to step things up a gear. And we are at a tipping point, where such an agreement might finally be possible. The European Parliament is on the cusp of a vital vote to decide on whether to halve Europe’s food waste by 2030, as part of the Circular Economy Package. > Yes! Magazine: I Saw the Revolution in So Many of the Small Places We Call Home (Sarah Van Gelder). The article is an excerpt from The Revolution Where You Live: Stories From A 12,000 Mile Journey Through A New America. Her conclusion: “The only way such a big revolution can happen is, ironically, at a small scale. Only where we live, in the neighborhoods and cities and towns where we encounter each other and know each other, can the transformation be deep enough. Only in community can we reconnect to each other, to the natural world, and to our own deepest values. That reconnection is our source of power and hope. No charismatic leader or top-down revolution can bring about the needed change. Only by working together in the places we call home can we overcome isolation, embrace our differences, confront the extractive economy, and create the sort of world that will work for all of us”. > Ensia: Landfills Have A Huge Greenhouse Gas Problem. Here’s What We Can Do About It. (Erica Gies). Globally, trash released nearly 800 million metric tons (882 million tons) of CO2 equivalent in 2010—about 11 percent of all methane generated by humans. The United States had the highest total quantity of methane emissions from landfills in 2010: almost 130 million metric tons (143 million tons) of CO2 equivalent. Because methane typically has a much shorter life in the atmosphere than CO2, reducing methane release from landfills can help rapidly reduce climate change risk. A more direct way to reduce landfill methane would be to reduce the amount of methane-generating materials going into landfills in the first place. With some 40 percent of all food wasted in the United States, reducing food waste offers big opportunities. After reducing food waste, the next best step is turning what remains, along with yard waste, into compost rather than sending it to landfills. > Citizens for Sustainability: November Forum-Meeting, , St. Anthony Village Community Center, 3301 Silver Lake Rd. > Nativity Lutheran Church: Sustainability And Equity Series, Sundays, Nov. 6, 13, 20, , Fellowship Hall, 3312 Silver Lake Rd., St. Anthony Village, MN. > Climate Reality: 24 Hours Of Reality: The Road Forward, Worldwide events promoting climate change solutions, ; mark your calendars. > National Geographic: Before The Flood Documentary. Watch this powerful new movie streaming; narrated by actor-environmentalist Leonardo DiCaprio. > Michael More: Where To Invade Next, Trailer “The American Dream” is alive elsewhere, and needs to be imported back. Countries visited and lessons learned. > Population Growth: Population Clock – Poodwaddle World Clock. Watch the population increase minute by minute. > Bloomberg News: Bloomberg Carbon Clock. A real-time estimate of the global monthly atmospheric CO2 level. > US Debt Clock: U.S. National Debt Clock: Real Time. Every aspect of the economy is documented.